KARL LAGERFELD is pleased to announce it will collaborate with PUMA for the first time ever, to introduce a capsule collection for men and women. Marking 50 years since their iconic sneaker’s first launch, PUMA’s “Suede 50” program throughout 2018 culminates in the highly-anticipated release of the KARL LAGERFELD X PUMA collection. Originally invited to design a KARL LAGERFELD iteration of the classic Suede sneaker for the anniversary celebration, the partnership soon developed into the creation of a complete 13-piece capsule. 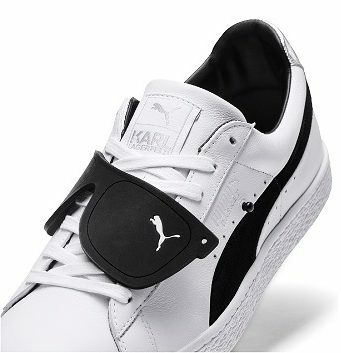 Bringing together two iconic brands, each with their own unique aesthetic, the result is a chic, contemporary fusion of KARL LAGERFELD’s signature design aesthetic and PUMA’s sporty, street style classics. The KARL LAGERFELD X PUMA collection features two unisex Suede sneakers inspired by KARL LAGERFELD’s iconic signature aesthetic – a tuxedo jacket, high white collar, tie and sunglasses. The shoes blend Karl’s timeless look with contemporary streetwear style, and feature either a playful KARL graphic or removable sunglasses detail. The women’s offering includes a tuxedo-inspired T7 track jacket with matching pants and a T7 Jumpsuit, both are stylish plays on PUMA’s iconic Track Jacket with 7mm stripes, a Track Top, and a cropped Tee. The men’s collection features a slim-fit Hoodie and matching Sweat Pants, plus a logo Tee. The clothing styles is further complemented by a backpack, a shoulder bag and a baseball cap featuring custom KARL LAGERFELD X PUMA branding.